The SDS-70 process significantly "raises the bar" of theatrical film entertainment to an impressive level never before possible. "Super Dimension-70 process obsoletes 3-D motion pictures, simply put you don't have to ware special glasses to get an amazing dimensional effect. The process is startling"
"Ah, this is what movies should look like"
There were action shots with radical camera movement and aerial images of the Grand Canyon with at least 12 stops of contrast in-between the brightest rays of sunshine and the darkest shadowy areas. There was an intimate close-up of a couple falling in love: you didnt need words to feel their emotions---it was like being there." "The clearest motion picture I have ever seen"
"What I have just seen is brighter, sharper and clearer than Imax and best of all SDS-70 fits into my theaters"
"Watching the demonstration film for SDS-70...one has second thoughts of watching movies any other way. It is truly that spectacular." The SDS-70 65mm camera operates at either 24fps. or 48fps. to photograph scenes that have the conventional "third person" 2-D content, or a "first person" 3-D like, in the movie experience. These scenes are edited and combined in a patented process called Dynamic Image Enhancement onto the finished 48fps preprint master. SDS-70 release prints are run on the digitally controlled IMPACT SDS-70 proprietary large format projector and platter system. " Pin registration" steadiness is designed into the IMPACT projector transport. There is no significant film jump or weave on the screen. Prints can run for more than 2,000 passes without damaging perforations. Conventional 24 frame 35mm prints can be extracted from the SDS-70 master elements providing for wide release to conventional 35mm theaters. The projector operates at 48fps and presents each frame twice at a display rate of 96 images per second. At this display rate there is no projection flicker and the images on the screen are brighter, sharper and clearer than any motion picture film format. SDS-70 significantly surpasses 35mm and D-Cinema quality. Screens as big as 70 feet can be employed and have a reflective light level of more than 16ft Lambert's. SDS-70 can fit into any Megaplex without costly construction and most importantly participating exhibitors will NOT have to buy the projection equipment. 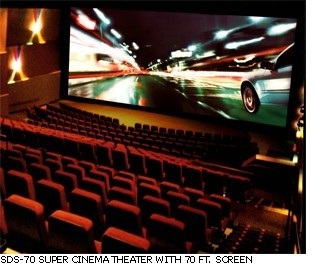 The technology will be licensed to the distributor of a SDS-70 feature film and paid for through the "value added" admission price paid for at the box office. Read about the significant impact SDS-70 is having on Hollywood! In an article originally published on ScriptToDVD.Com written by William Kallay. Click here.